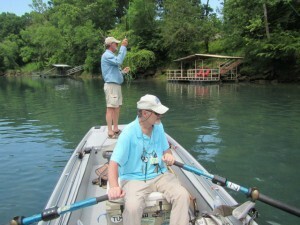 George Born and Dan Hudgins are old friends who have been guiding and fly fishing the Little Red River for decades. 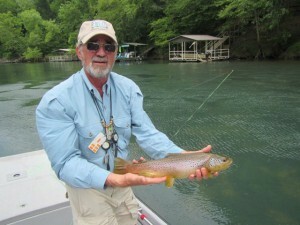 It is always a treat to fish with them and we had a day on Monday that you dream about for your clients on a guide trip. Bo calls them, “Beer Can Days,” because you can cast virtually any fly, even a beer can, and the trout will take it as it is just one of those days when the fish are really feeding. One reason may be that there was a wide variety of insects that were on the water. 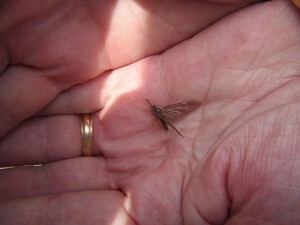 We saw March Browns, Caddis, Blue Winged Olives and a bunch of Midges throughout the day. It was a beautiful early summer day and the water levels on the river were near perfect. 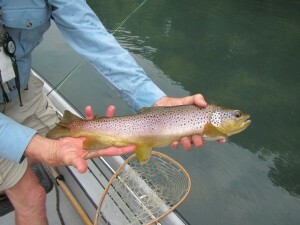 The guys each took their turn on the oars and everyone caught a bunch of really nice fish including the beautiful Brown Trout caught by George in the above photo which was taken on his go-to-fly, Born’s Hairy Legged Sowbug. Oh, another reason that so many fish were caught is that all of these guys are pretty darn good fly anglers!